Longtime laptop- and messenger-bag vendor Timbuk2 recently entered the luggage market with a line of travel bags. Although the line includes rolling suitcases, carry-on bags, and totes, it also includes a unique backpack, the Patrol , designed to carry both your laptop and a weekend’s worth of clothes. I’ve been testing the Patrol for the past few weeks, a period that included a round-trip flight across the country. At 19 inches tall by 14.5 inches wide and 8 inches deep, the Patrol is a good deal larger than most laptop backpacks—too large for placing under a coach-class seat, though compact enough to easily fit in an overhead compartment. These dimensions make the bag’s main compartment big enough to hold a pair of shoes, one or two changes’ of clothes, and a few other small items. (The bag is soft-sided, so this main compartment doesn’t look very deep. But once you zip it up, you’ll be surprised how much it can hold.) Also inside the main compartment is a large, zippered pouch, attached at only one side so you can flip it between layers of clothes, for storing dirty clothes or other items you want to keep separate. You also get two zippered, waterproof pockets. Four compression straps on the outside of the bag help keep the contents as close to your back as possible. Behind the main compartment, against your back, is a large, padded laptop sleeve, accessible via a separate zipper on top of the bag, making it easy to remove your laptop at security screenings. The laptop sleeve isn’t rigid, so it’s not as protective as it could be, but it’s got enough padding to keep your laptop safe from most reasonable bumps. Although Timbuk2 says the sleeve is meant for 15-inch or smaller laptops, Apple’s 17-inch MacBook Pro should fit easily. I was able to fit a 13-inch MacBook along with its AC adapter and a couple small accessories. The front of the bag, away from your back, includes two large, zippered pockets. The bottom one is perfect for carrying—and quickly removing—your TSA-approved 1-quart bag of liquid items. The top one is slightly smaller, but includes an organizer panel for pens, a phone, an iPod, or other smaller items; there’s also a removable key fob. One side of the bag features a stretch pocket for carrying a large water bottle; the other side has a zippered pocket, the length of the bag, with a smaller mesh pouch inside. The pack’s straps unhook at the bottom and tuck into a Velcro-closure compartment on the back of the bag—useful when placing the bag in an overhead compartment; carrying it by one of the two padded handles (one on top and one on the side); or, if necessary, checking it as baggage. Also on the back is a zippered pocket large enough for a passport and folded documents. Besides being easy to overlook if you don’t know it’s there, this pocket is flush against your back when you’re wearing the pack, making it a good place to store important documents and some extra cash. Just don’t put too much in the pocket, or you’ll feel the lump uncomfortably against your back. 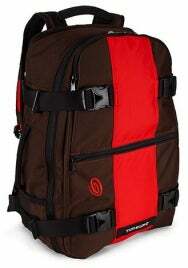 As with most Timbuk2 bags I’ve used over the years, the Patrol looks and feels sturdy. 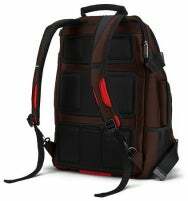 The bag material is heavy, ballistic nylon; the shoulder straps and back panel are well-padded and comfortable; and the zippers are meaty and work smoothly. The backpack straps also include thick fabric slats for clipping accessories. The Patrol is available in black; brown with “flame” red; and army green with olive green. The downside to the Patrol’s larger size, compared to most backpacks, is that if you’re not mindful when loading it up, you can end up with a heavy, heavy load on your back—and the bag doesn't include a waist strap for better load distribution. (The Patrol itself weighs 4 pounds.) But even with a laptop, AC adapter, two days’ worth of clothes, some magazines, a water bottle, my toiletries, some snacks, and a few gadgets and accessories, the Patrol fit comfortably and didn’t feel nearly as heavy as I expected. It’s a comfortable, well-made, and thoughtful alternative to a rolling carry-on for short trips. Updated 3/24/2009, 3pm: added note about lack of a waist strap.